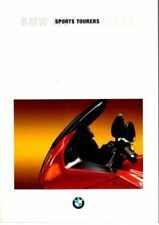 Brochure with 28 pages on the R1200C from 1997. brochure from 1997. BMW R 1200 C. Text in English. Large size. centre page is loose but holes are intact. X2 - brochures. mint cond. All brochures sent in hardback envelopes. 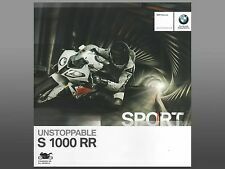 RARE BMW R100GS R 100 GS 1993 Genuine Factory Sales Brochure Fact Sheet - LOOK! THE TWO YOUNGSTERS IN BMW'S FLAT TWIN BOXER FAMILY. R 80 R 80 RT. BMW MOTORCYCLES PRESS PHOTO. BMW PRESS PHOTO. CONDITION USED GOOD FOR YEAR. January 2018 edition of a BMW motorcycle official range marketing brochure featuring the full range of BMW motorbikes. Immaculate/new item. Brochure has 52 pages. 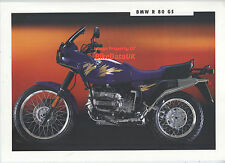 A rare original BMW R 1150 GS motorcycle brochure dated Aug 1999 with German text. Brochure is 24pp illus in colour and is in very good condition. 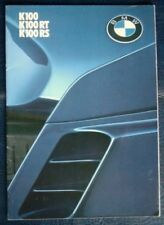 RARE BMW R80RT R 80 RT 1993 Genuine Factory Sales Brochure Fact Sheet - LOOK! It is dated 1988. Contains 24 pages including the covers. There is also a separate price list included. This item is in good condition with light wear, mainly to the edges and corners. 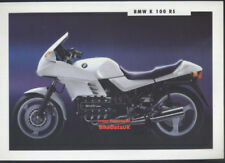 This BMW Original Factory UK Sales Brochure covers the K100, K100RT & K100RS Motorcycle models that were in production during 1985. With 36 colour pages and more than 50 photo's / illustrations it is an essential finishing touch for the '85 BMW K100 Series Motorcycle owner. 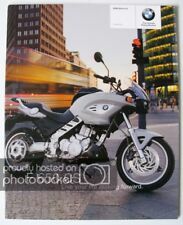 BMW F800 Motorcycle Brochures x 5. All F800 related inc. S, ST and GS. A couple have the price lists enclosed. 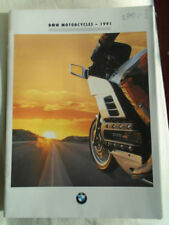 Bmw R1200GS Motor Cycle Sales Brochure. Condition is Used. Dispatched with Royal Mail 2nd Class Large Letter. Printed in 2006. BMW R 65 LS. BMW MOTORCYCLES PRESS PHOTO. BMW PRESS PHOTO. CONDITION USED GOOD FOR YEAR. YEAR: NOT KNOWN. MOTOR CYCLEBROCHURE / LEAFLET. THE 1989 RANGE. CONDITION USED GOOD. 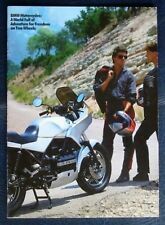 RARE BMW R100GS PD R 100 1993 Genuine Factory Sales Brochure Fact Sheet - LOOK! An original sales brochure in ‘used condition’. Covers the BMW clothing available for the 1994 season. 10 sides (A4 size) Booklet format with 4 open out pages. GREATER SAFETY WHEN BRAKING: BMW MOTORCYCLE ABS. BMW PRESS PHOTO. 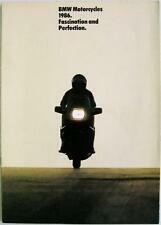 BMW MOTORCYCLES PRESS PHOTO. CONDITION USED GOOD FOR YEAR. It is dated 1987. Contains 24 pages including the covers. This item is in good condition with light wear, mainly to the edges and corners. BMW MOTORCYCLES RANGE MOTORCYCLE SALES BROCHURE For 1986 MODELS FEATURED: K100, K100RS, K100RT, K75C, K75S, R80, R80RT, R80G/S & R65. PUBLICATION No: 5 11 20 35 20 9/85. FORMAT: Stapled Brochure, 16 Pages. LANGUAGES: English. ILLUSTRATIONS: Colour Photographs. SIZE APPROX: 29.7cm x 21cm CONDITION: Overall condition is VERY GOOD. Handling marks, light soiling/discolouration & minor creases. Please see attached photographs and if you require any further details we will be only too happy to assist. Features 1991 K75. One "genuine" BMW Factory sales brochure. 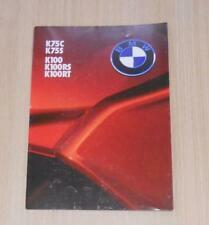 Genuine original BMW Factory publication.